Superb & extremely stylish oak Arts & Crafts tub/desk chair by Liberty & Co, very much in the Glasgow Style; 1905. 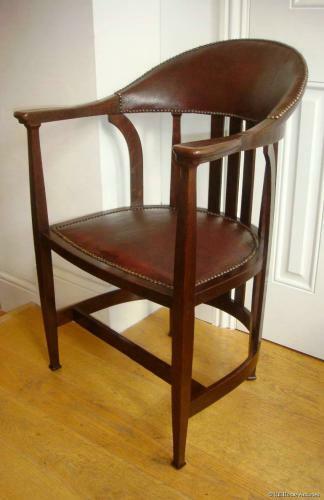 A very similar chair is illustrated in their catalogues of a Scottish library interior, which in turn is reproduced in the recent book on Liberty furniture p265. Approx 35.5" high, 17.25" seat height and 23" overall width.